In an attempt to calm emotions, I’ve left a comment at John’s blog which addresses the core misapprehensions that John expresses. Please bring this to the attention of anyone else who misunderstands the state of the case. I’m sorry for any inconvenience this has caused. Below, I slightly expand some of the comments I made at John’s blog. His original post is quoted in green. John, it’s been tremendous to have your interest and get your support for the work we’re doing here in New Zealand. But let me try to correct some of your assertions before the blogosphere goes completely out of control. You’ve taken a couple of points a bit too far, perhaps from a misunderstanding of NZ law and the actual case we’ve brought against NIWA. [My points in square brackets] apply to the single immediately preceding sentence. NIWA’s decision renders an almighty self-inflicted wound to the government agency’s already dire credibility. But worse, the move will be regarded as contempt of court and thus permits the court to grant the plaintiff’s motions for punitive sanctions, including summary judgment. As such, this would bring a swift victory for skeptics with profound legal ramifications around the world. In the sparsely-measured southern hemisphere the New Zealand climate data is critical to claims about a verified global temperature record. Last year NIWA gave an undertaking to the Kiwi Parliament that it would permit external peer-review by scientists from Australia’s Bureau of Meteorology (BoM). This evidence was to be presented to the court to help resolve a drawn out legal battle to prove whether or not NIWA had cooked the country’s climate books. Lawyers for the jubilant skeptics are to motion for an adverse inference against the defendants on the grounds that they intentionally have “spoliated” the evidence (spoliation is the withholding/destroying of evidence). As with the Kiwi case, over in Canada Tim Ball is having a hard time getting his court adversaries to be forthcoming in releasing their hidden data and records. As in any common law jurisdiction, when a litigant refuses to comply with the opposing party’s motions for disclosure then spoliation doctrine comes into play. Persistent refusal by any party in a lawsuit to hand over evidence on request renders them liable to severe sanctions. As with his Kiwi counterparts Ball will be hoping to win the adverse inference. If granted in these cases the jury will be directed to rule that the party withholding the evidence has done so “from a consciousness of guilt.” In other words, the juries will be directed to rule that climatologists refused to disclose the evidence because to do so would prove they intentionally falsified the climate records to get a predetermined outcome. But why is this victory in New Zealand so important in the world context? The skeptics took their case to court and the protracted proceedings culminated in a compromise whereby NIWA agreed to allow only scientists from Australia’s Bureau of Meteorology (BoM) to “peer-review” their data in secret. CCG agreed to abide by the BOM findings and have them put before the court. But the courtroom farce deepened last month (July, 2012) when, at the eleventh hour, NIWA desperately opposed the admissibility of the BOM review they had asked for. I hope this helps return some balance to the affair. Well, Mr. RT, the puddle is now muddy. My computer modeling projects that it will get muddier over the coming months. I think you have encountered the virulence of the blogosphere. And I think Mr. JO’S does put a heated knife into the butter quite appropriately in some points that he makes. However, I’m sure your clarifications will give him pause. I await his response with great interest. Regardless of the outcome of the case (and I know this will grate with you), a moral victory for the underdog nevertheless can be claimed on several fronts. If the final case outcome is in the plaintiff’s favour, then John’s piece gives some indication (according to my supercomputer) of the rhetoric that will flood skeptic blogs. If not, then there will be careful dissection, analysis and review of the Court’s carefully worded findings and the multidecadal war of attrition will continue. In either case, moral victory is assured. I take your point that pre-emptive grandstanding is unhelpful in a war of attrition. I.E., “Don’t go off half-cocked”. Nevertheless, he may have some points, but it’s better to keep them in your back pocket to play later. Your determination, Richard, to try and stop the deniosphere getting overheated is genuinely commendable. However, irrespective of the merits or indeed result of your court case, all those that see themselves as followers of Galileo are picking a fight with history and science. Therefore, even if history is always written by the winners, as David Aaronovitch has pointed out, conspiracy theories are history as written by the losers. Richard Treadgold has come back to point out one or two apparent presumptions in my piece. Treadgold expresses his fears, “We run a distinct risk of contempt of court if we appear to endorse the wild claims about the state of the case. ” However, Treadgold is incorrect because sub judice restrictions do not apply to public policy civil proceedings where the respondent is a government agency. Moreover, I have sought no input from Treadgold or anyone involved in the case. I would like to reiterate that my assessment of the facts is correct and my analysis of the doctrine of spoliation stands. Perhaps the doctrine is not yet fully understood and applied in Auckland as it now is in the US and UK. But the courts in NZ will surely come up to speed on this. The inescapable facts in this case are that six weeks after CCG’s petition for judicial review NIWA sent its data to BoM so that scientists from the Australian Bureau of Meteorology (BoM) would serve as a third party auditor. This was instigated upon the February 2010 direction of NIWA’s minister (the Hon. Dr Wayne Mapp). Mapp gave undertakings that BoM would independently audit NIWA’s numbers and the confidence levels of the adjustments would be calculated and disclosed. If Mapp (and NIWA) now reneges on this undertaking then the court cannot make any other finding than NIWA (and Mapp) are withholding the BoM audit from “a consciousness of guilt.” As such, NIWA (under Mapp’s instruction) is perpetrating a willful spoliation after Mapp (and NIWA) have staked their credibility on the BoM review. This goes to the heart of determining whether malfeasance has been committed. The duty of the court is to now punish the spoliator. Perhaps the spoliation doctrine is slightly more advanced in its application in the U.S. where I have most experience of it. But an international scandal will befall the NZ government if the court does not accept that an adverse inference determination must be the logical outcome of this corrupt government U-turn. I hope Richard Treadgold and his bold New Zealand skeptic counterparts seize their opportunity for victory and go all out to compel the court to apply the spoliation doctrine to the fullest extent of the law. It isn’t about you or the fact that a public agency is involved, it’s about us avoiding disrespect to the Court. And I would have been happy to brief you on the court case had I been asked. They didn’t — a peer review was done. Hmm, inspiring sentiments. But the three-day hearing ended two weeks ago. Beyond reach of further persuasion, Mr Justice Venning will arrive at his conclusions on his own. I disagree. The Hon. Dr Wayne Mapp gave an undertaking that the finding of the review would be disclosed. NIWA now says they won’t. Your government has failed to follow through on this undertaking which has implications not only for taxpayers in NZ but in those other nations similarly under assault from government-sponsored secret science used to bolster tax raising policies about “global” warming (of which NIWA data effectively serves one quarter). While I’m sure Justice Venning is not going to be swayed by blog commentary written from the other side of the planet, the court is nonetheless duty bound to take on board Mapp’s willful omission to comply with the public interest requirement of the promised transparency. Can you enlighten me, John, as to what exactly you mean by “government-sponsored secret science” (as it sounds like invocation of conspiracy theory to me)? For the record, I think our greatest problem is government-sponsored public subsidy of the oil industry (which is at least an order of magnitude [i.e. ten times] greater). Increased frequency and severity of extreme weather (of all kinds) is an inevitable consequence of a warming atmosphere (with more moisture in it more of the time). Given that this is now becoming an increasingly-obvious reality, I am astonished that you continue to claim climate change is a myth peddled by governments in order to tax people more heavily. There is simply no evidence for your left-wing conspiracy to over-tax and over-regulate people (so as to make everyone poorer). Whereas, there is a great deal of evidence for a right-wing conspiracy to under-tax and under-regulate industry (so as to make a few people richer). Having read your link it is clear we have opposing views on the interpretation of the evidence. At this juncture we cannot categorically state there is a proven fraud perpetrated by government scientists and we should not rush to press criminal charges – yet. These people have been evading justice with a cynical and concerted refusal to abide by FOIA demands and release all their metadata used for their ‘homogenized’ adjustments. We have had to resort to using the courts to force the secret science out into the open- and why shouldn’t we? It’s all govt science bought and paid for by us taxpayers – and without doubt there is a mountain of evidence in the raw data contradicting your advocacy for climate alarm. But before we have absolute proof of the crime we are entitled to infer, based on the raw data alone, that it is you and not me who is in the weaker position. I say that because we have no reason to trust any “scientist” who claims we are approaching a “climate crisis” when these self-servers won’t permit open and independent analysis of their methods for independent replication and verification. I’m here speaking in defense of consumers who have been asked to pay more direct and indirect taxes to address a non-problem. That’s why I am bemused by your sweeping statement of a “public subsidy of the oil industry” which you assert is “at least an order of magnitude [i.e. ten times] greater.” What you are not admitting is that the so-called “subsidy” contains billions allocated as tax refunds/discounts to consumers – not taxpayer monies for the companies per se! As for climate – any sane person knows it has changed for 4.5 billion years in what is a chaotic, non-linear system and will go on changing despite the hubris of eco-warriors who claim they can “fix” it within a two degree Celsius rise! Any examination of the historical record proves we’ve been on a slight warming trend since the LIA ended in the 1800’s and we are past due a return to a major ice age – confirmed by many peer-reviewed studies. I certainly don’t see any increase in frequency of severe/extreme weather with any human signal whatsoever – the temperatures and rates of change in the climate we’ve seen are well within the bounds of natural variability. Indeed, not even the IPCC can claim to have empirical evidence to verify such a human signal. My colleagues and I are simply concerned citizens dedicated to advancing our (self-funded) empirical scientific research. Our experiments are increasingly proving there is no greenhouse gas effect discernible in the atmosphere. Indeed, only the infant science of climatology permits the unscientific and unproven claim that gases “trap” heat. As such any proposal to limit carbon dioxide emissions is premised on junk science. I really enjoyed Watermelons by James Delingpole. I recommend you read it. I also enjoyed your one star review of Watermelons on Amazon, where you state that you didn’t read it. Funny that you dismiss our so called conspiracy theories, yet down thread you claim there ia a right wing conspiracy theory to under tax us. That concept is so Guardianiste I hardly know how to respond. You don’t think that it might be just your perception after the introduction of television and an increase in television coverage of weather events? “During the heat wave of late June and early July, high temperature extremes became newsworthy. Claims that there were thousands of records broken each day and that “this is what global warming looks like” got a lot of attention. Now, it gives some people great comfort to offer a quick and easy answer when the weather strays from the average rather than to struggle with the real truth, which is, we don’t know enough about the climate to even predict events like this. The blue line between triple point and critical point is the change of phase line between gas (vapour) and liquid (water in the form of condensation and clouds and thence rain). A question Martin: how do think the massive flood plain of Thailand of which Bangkok is at the foot and flooded recently, was formed? Wouldn’t the answer be “by massive floods”? And wouldn’t the time span of those massive floods be in the 1000s of years? Extreme weather is not a new phenomenon Martin. In support of your first point re secret science: IPCC’s Secret Letter where Steve McIntyre details the ongoing skirmishes relating to FOIA requests and IPCC smokescreens. Perhaps you read into my words what you have heard in other places. I don’t know about being a follower of Galileo, I’m just asking scientists in public service: 1) what have you done and 2) what is your evidence? I’m not sure you refer to this post when you mention conspiracy theories, but neither it nor any other I’ve written claims a conspiracy of any kind. You repeat some important errors. The increased frequency and severity of extreme weather is only postulated, not proved. See Managing the Risks of Extreme Events and Disasters to Advance Climate Change Adaptation (SREX) (I strongly recommend starting with the more easily digestible Summary for Policy Makers). It shows in stark detail the huge uncertainties about predicting extreme weather over several decades. It highlights for me how much is not known about the climate of our planet, nor about the effects of global warming, nor about the causes of global warming. It’s highly likely that warming will lead to fewer and weaker storms because of a reduced north-south temperature gradient. I find it incredible that increases in extreme weather are inevitable. The IPCC assumption is that CO2-caused warming will increase atmospheric water vapour (wv), which will amplify warming. Recent papers show this isn’t happening yet, and atmospheric wv has been either declining for years or at the very least is not increasing anywhere near the predicted rates. See Scherer et al. and Roger Pielke Sr.
Of course, as Richard C points out, the temperature has to be going up, too, but for 15 years it hasn’t been. There are many other references. I cannot imagine why you assert that “this is now becoming an increasingly-obvious reality”. Climate change is a myth peddled by governments. Our own government admitted a few years ago that New Zealand’s efforts to reduce CO2 emissions would have no effect on the climate, but we had to do it anyway to show solidarity with our trading partners. But there’s nothing imaginary about the increased prices of petrol, diesel, gas and electricity because of the ETS. Even wind power is more expensive because of the ETS. But it’s still not a conspiracy – the government is taxing us under false pretences in plain view. Richard, my only criticism of your O’Sullivan corrections is that you bothered. Neither Mr O’Sullivan nor “his” PSI front has any credibility. In recent months he has tried this rubbish on Monckton and then my good friend Rupert Wyndham. He simply confirmed that he is a fool. The answer to your question is ‘Yes’. The man is a menace; loose cannon is far too complimentary! He’s not only abrasive and self-promoting, he constantly goes off half-cocked, as Treadgold’s damage limitation exercise makes all too clear. Forgive me if I do not edit the following exchange of emails, but I think that you and your contacts (Treadgold, in particular, perhaps) may find pertinent and useful material in them. PS Best of fortune in your case in NZ. Strong advice, though – don’t touch O’S with even the dirty end of a 40 ft barge pole. What follows is 4400 words of exchanges between Rupert Wyndham and John O’Sullivan and others. Life is too short for this. I’ve kept the email for future reference and possible use, but allow here the briefest of summaries, to wit: Several people advise us kindly to have nothing to do with John O’Sullivan. My thanks to them, and a warning to John not to take the opportunity to fight it out again in these columns; I won’t publish it. Everyone’s welcome here to discuss the climate, because that’s our purpose. I will mostly ignore what problems they might have with each other, so don’t bring them up. I’ve always found it fascinating to see complex court cases fought out in the pages of daily newspapers, and I guess they will increasingly be subject to “side bets” in the blogosphere. One thing seems to be clear: Minister Mapp told Parliament that a peer review of NIWA’s work would be undertaken by Australia’s BOM. Why did he do that? He must surely have expected that this step would add credibilty in the eyes of the public (and opposing politicians). He must have been concerned that NIWA’s unsupported opinion wouldn’t cut much ice, as they obviously had a vested interest in defending their own previous work. So, to a large extent, the Minister did stake NIWA’s reputation on its ability to win an endorsement from the Australian agency. And NIWA reinforced that position when it told the Court (in its Statement of Defence) that BOM was about to deliver a glowing peer review. And then it all fell apart, overnight. Now NIWA says it doesn’t rely upon the BOM peer review any longer. Puzzlement. What went wrong? Two years after the Minister’s promise, the whole BOM thing has apparently become a bad idea. Is that “spoliation”? The excuse offered to the Court is surely absurd. A paper about old temperature records is so secret that diplomatic relations between the two countries would be endangered if it was seen by a Judge?? Is this the same scientific discipline which got spanked for overdone secrecy as a result of Climategate? Thanks for trotting out that facile and irrelevant criticism. I would be far more impressed if you could actually refute my assertion that the book is self-evidently nonsense – not all environmentalist are socialists. I am afraid that Christy is a sock puppet for the fossil fuel industry and his testimony to the Senate last week was a very tired-looking rgish gallop of arguments that have already been repeatedly falsified. Also, what the hell is a distinguished professor doing signing up as a co-Author with Anthony Watts – a college drop-out and ex-TV weatherman? As for extreme events, you are merely stating your opinion as fact; and whereas I may sometimes do this as well – I do not have to rely on cherry-picked studies from contrarian websites; nor do I have to insist that the consensus is false (an assertion that requires a whole litany of implausible contingencies in order for it to be true). I would also be interested to read your justification for dismissing James Hansen’s latest offering (and his impending publication in the PNAS) – all part of the conspiracy I guess? So as to avoid stating opinion as fact, I should make it very clear that, in my opinion, your conspiracy is a fanciful illusion. This is because, as I said to Richard, it requires a whole range of implausbile contingencies for it to be true. As for you ludicrous parroting of the “climate change is natural” mantra… It does not matter how many times you or Christy or anyone else says this, it does not become true. Climate science is not a conspiracy; it is all based on very basic physics. Just because you find anything incredible, Richard, does not make it any less likely to be true. As with everything else the IPPC has ever been allowed to publish (after being vetted by governments keen not to frighten the horses), SREX was conservative and overly-optimistic. I would be keen to know what you too make of James Hansen’s latest assertion that we do not need to rely upon model predictions (as past predictions have already been validated by events to-date); and whether you too find it necessary to dismiss him as having some hidden agenda; rather than just taking his expert concern (having fist studied the planet Venus) at face value. As an Australian citizen (albeit resident in the UK), I am aware of the fuss the Carbon Tax has caused in the Antipodes. However, I think Hansen has provided us all with a workable and fair solution – a fee and dividend system – wherein governments receive nothing and individuals are given an incentive to make wise choices… However, if you are going to insist that such choices are unnecessary because there is no reason to believe that doubling the CO2 content of our atmosphere in 300 years (something we are well on the way to doing) will have no significant effect… I think this “conversation” may be over. How does this “government vetting” process of the IPCC work? Why does adjusting temperatures in an incorrect and biased way require a global conspiracy? You are the only one using this term Martin. if you could actually refute my assertion that the book is self-evidently nonsense – not all environmentalist are socialists. The book doesn’t say “all environmentalists are socialists”. People who have actually read the book understand this. Do you have any evidence that Christy is a “sock puppet” (sic) for the fossil fuel industry? Is this the standard line that you learn at Environmental Sciences in the UK these days? As for you ludicrous parroting of the “climate change is natural” mantra… It does not matter how many times you or Christy or anyone else says this, it does not become true. Cart before horse logical fallacy methinks. Climate change has always been natural. It is not trying to “become true”. What is being postulated by CAGW proponents is that un-natural climate change is overtaking, or is about to overtake, natural climate change, complete with massive positive feedback mechanisms, which will alarmingly change Earth’s climate to more like Venus’. Until you show empirical evidence for the un-natural signal in all that climate noise, (which would be empirical evidence of some unprecedented trend which has never happened before industrialisation), it is perfectly reasonable to say that climate change is natural. They don’t think it’s a conspiracy theory, but a monopoly that clings to one hypothesis (that carbon dioxide will cause dangerous global warming) and brooks less and less dissent. Again and again, climate skeptics are told they should respect the consensus, an admonition wholly against the tradition of science. Martin wishes it to be the case that he is correct in his conspiracy theory that we skeptics are in the pay of ‘Big Oil’ and he fails to see the irony that he is calling us the conspiracy theorists! He then doesn’t seem to grasp the basic fact that if climatologists were to admit there was no climate crisis then they’d all have talked themselves out of a job. He needs a history lesson: Until the 1980’s there were no climatology faculties in any university until UK PM Margaret Thatcher gave the go ahead for Shell and BP to pump millions into setting up the CRU at the UEA. Thatcher was the first western leader to promote the idea of “greenhouse gas” warming because she needed an excuse to validate her dismantling of the UK coal industry after the wave of national coal strikes in the late 70’s and early ’80’s. She also pioneered the myth of of “greenhouse gas warming” so as to win support for her strategy of growing the UK nuclear industry. Also, Martin has no answer to the inescapable fact that current global temperatures are entirely within the bounds of natural variability – while the IPCC has never been able to affirm a single study proving otherwise – despite media hype suggesting the contrary. BTW Martin, repeated use of the terms “gish gallop” and “sock puppet” does get a little tiresome. Do you have any variations to break the monotony? Martin Lack’s pronouncements seem to be taken directly from the nonsense promulgated by Monbiot and and his foaming-at-the-mouth acolytes in the the Guardian’s CIF columns, whose title surely must take first prize for irony. He is very obviously a troll and should not be taken seriously. As soon as John O’Sullivan starts throwing words like “fraud” and “criminal charges” around he is opening himself up to being called a conspiracy theorist. I would be deeply offended my such slurs if I was a climate scientist. What methodology did BEST use for NZ and which stations did they use? It is an interview with Richard Muller. He doesn’t use the words “fraud”, but his remarks about Michael Mann and the UEA team are not exactly complimentary. This is an interview well worth listening to. Muller makes some very reasonable comments about exaggeration by climate change activists, hurricanes, polar bears and Al Gore. i am not exactly sure why the warmist creed are welcoming this guy with open arms into their holy citadel. That’s interesting, I assume you mean BEST’s global trend. Does BEST show this centuries linear trend to be flat (no warming) as NIWA’s does for NZ? I note that a more appropriate trend method than linear (a curve) shows NIWA’s 7SS trending down this century – same for BEST? Basically they are using unadjusted data but reducing the relative weighting of measurement anomalies when compared with nearby stations. My personal experience of kriging is that it can lead to misleading interpolations but that it is valid for estimating averages over a wide area or time horizon. it is a little hard to make any kind of comparison that is relevant to the 7SS case if we can’t compare apples with apples, as I don’t see too much detail on how they got these numbers. Thanks for the heads-up, Andy. I wandered over to Martin Lack’s blog to check it out and was quite disturbed by the nasty tone of it: I am puzzled as to how a bloke with a university science education could get so much science so wrong and can only assume that his qualification in theoretical politics is the source of his startlingly one-eyed perspective. The number of scientific fallacies he obviously takes as gospel is as jaw-dropping as his willingness to derogate those who don’t agree with him as ‘flat-earthers’. In my opinion, his pronouncements here may be elegantly phrased, but are still trollery. His nastiness about Anthony Watts being a high school drop-out is snide and silly; Einstein and Winston Churchill were school drop-outs too! Einstein and Winston Churchill were school drop-outs too! The only thing more jaw-dropping than the general stupidity displayed on this website is the apparent eagerness of the regulars here to display it in public. Thanks for the information, Richard, but insulting us all at the same time is illogical and obnoxious. Some prefer to admit to ignorance and be corrected than to continue in ignorance – do you do that too, or do you know everything? The object of your sarcasm is the kind of trivial information one might honestly believe, and examples abound, so Alexander’s small mistake might have earned intelligent correction but not this oafish ridicule. Are you interested in matters of climate? Let’s give Richard a big round of applause for dobbing in our host to Tui for using the “Yeah Right” poster. What did you find to be “similar” between the NIWA and BEST series? That both of them used Arabic numerals? Or the Celsius scale? If BEST is right, then NIWA got its unadjusted 7SS totally wrong, it’s adjusted 7SS almost as wrong, it’s post-1960 trends wrong — and nothing right. I’m beginning to understand why the warmists have rejected Muller with such vigor. While his 300-year average might favor them, all his detail runs totally counter to the IPCC – approved numbers. I now see how you operate. You are perfectly happy to allow others to post attacks on me on your blog but you are not going to give me any right to reply. Fair enough. I’m sure from that others can judge for themselves what kind of person you are. John, I said I would “allow here the briefest of summaries, to wit: Several people advise us kindly to have nothing to do with John O’Sullivan. My thanks to them, and a warning to John not to take the opportunity to fight it out again in these columns; I won’t publish it.” No attacks against you have been published here, so you need no right of reply. Reply, if you want to, on your own blog. You malign me without cause. This is my final word. I feel sure you understand the point I was trying to briefly make, Andy. However, if not, let me spell it out for you… Would you also dispute that the the book is basically a re-telling of Fred Singer’s “UN/WMO/IPCC conspiracy theory” as an attempt to justify believing anthropogenic climate disruption to be a “false alarm”? Andy – If the fact that a “distinguished” professor like Christy is willing to associate himself with someone like Watts and endlessly repeat previously debunked nonsense to the Senate is not sufficient evidence for you, I suggest you employ that favourite tactic of fake sceptics, and make a FOIA request for a list of those funding Christy’s research. No I don’t understand the point you are trying to make Martin. I actually don’t understand anything that you or your friends from the Joe Romm school of charm have to say. If you want to figure out why the public are turning off climate change in their droves, you should start to look in the mirror and figure out why people are sick of being constantly sneered at and told blatant lies and exaggerations. Despite my reservations about BEST and Richard Muller, I do have some time for the man because he is prepared to speak up against the likes of Mann et al. It is perfectly possible for the Hockey Stick to be bunk and AGW to still be a problem, a point that Andrew Montford has made in HSI. It is this one eyed religion zealotry that disallows any dissenting voices that turns me and countless others off. Or we could watch the lympiks. Telling people to sit through seven video isn’t really a big help is it? What do you mean by “wrong”? NIWA use external knowledge and cross-correlations to correct the raw data of a subset of weather stations. BEST uses more data but a cruder weighting approach to discount anomalous data. You would expect them to give different absolute averaged data points. The key is that they both show warming trends. I’ve got a short series of 10 videos I’d like you to watch. Simon – without knowing which stations were used and what methodology, its really not going to help this discussion is it? The court case was based around a very specific discussion of methodologies in the 7SS. I don’t see how BEST is relevant unless it addresses the issues raised in the court case. Richard Christie, I appreciate your corrections and thank you for them. Your nastiness, however, is unwarranted but does illuminate your tone and style very clearly. Nicely put, Australis. I take your point, thanks. As for the ‘global warming stopped in 1998′ mantra, please stop going down the up escalator. Please quote me correctly. I said the temperature has not been going up, not that “global warming” (whatever that is) stopped. The “escalator” graphic confirms the stasis and slight drop that I’m talking about. I also stated the period of 15 years, which means it started in 1997, not 1998. In other words, I ignore the peak of the giant El Nino. The conversation might well be over, quite likely because you don’t seem to listen very well. The Skeptical Science site uses clever linguistic and statistical tricks but is almost entirely unbelievable. Try reading their explanation of how atmospheric gases heat the ocean. Then describe the process briefly in your own words without laughing. Hansen seems to have turned quite peculiar since he started getting himself arrested. His credibility is very low for an astrophysicist. But not as low as Al Gore and Rajendra Pachauri, who make huge amounts of money from the AGW hoax. I see you studiously avoided my question re this century’s flat trend Simon. And my note that a more appropriate trend method than linear (a curve) shows NIWA’s 7SS trending down this century, and was that the same for BEST? Are you denying something Simon? So much for the “warming trend” – in either. Plotting a rolling mean would be more useful than a non-linear relationship that does not necessarily reflect underlying processes. Your regression is being dominated by the 1998 El Niño event. The curve would give an R squared value closer to ! 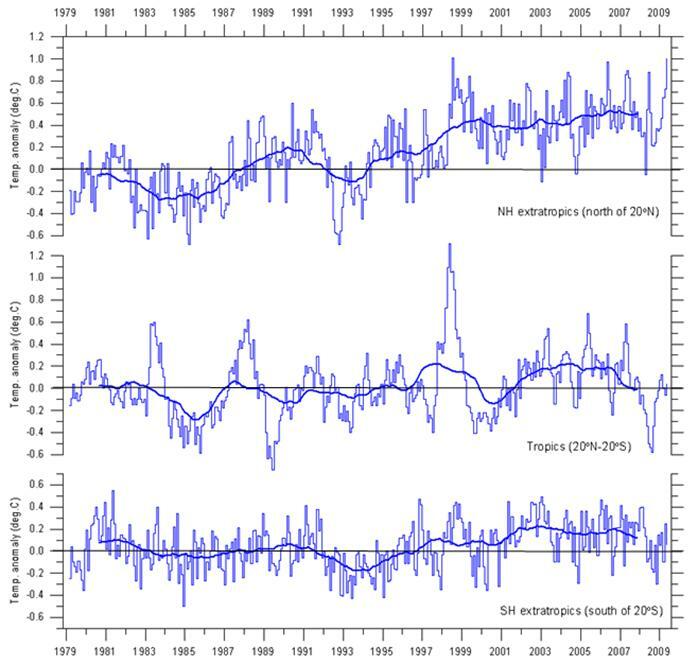 than the linear trend would so is statistically therefore, a better representation of the data..
All the “warming” in the NZ series occurred between 1935 and 1985 and that ‘s using NIWA’s 7SS data that includes the spurious 0.56 C/century skew. Salinger and Renwick attribute that warming to a natural climate shift. Since 1985 there’s been nothing out of the ordinary (beyond natural) trend-wise in NZ temperature. I wouldn’t expect anything better from a regular at Ken’s blog. Rudeness is par for the course on SciBlogs affiliated sites. As far as I’m aware, the SH extratropics would include NZ and AU.